This collection includes the Community Emergency Response Team (CERT) Training Materials. 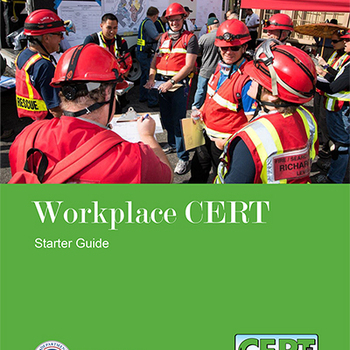 CERT Basic Training Course Instructor Guide includes an Instructor Guide, which provides an outline for teaching a CERT class, and the Hazard Annex. The Hazard Annex covers 13 natural and manmade hazards, and can be used to give CERT students an overview of each hazard. Each unit of the Guide and Annex is also available in Microsoft Word format, so instructors can download and change the units to better fit local CERT training needs. CERT Basic Training Participant Manual is meant for use by students in CERT classes. The Hazard Annex, which provides an overview of 13 natural and manmade disaster types, is also available here. Each unit from the Participant Manual and Hazard Annex is also available in a Microsoft Word format. Users can download the Word documents and change them to best fit their local CERT training needs. The PowerPoint slides can be used by instructors of CERT Train-the-Trainer classes. Each slide contains the key points of each Train-the-Trainer unit, as well as images. These slides are available in both PDF and PowerPoint format. Users may edit the PowerPoint files to best suit their local CERT classes' training needs. The Train-the-Trainer Participant Manual is meant for use by students in CERT Train-the-Trainer classes. The Manual provides an overview of CERT Basic Training course materials and effective teaching practices for CERT classes. Each unit of the Participant Manual is available in Word documents, so that users may change them to best suit local training needs. The CERT Basic Training PowerPoints are intended for use in CERT classes. These PowerPoints cover Basic Training, and also include presentations on 13 types of natural and manmade disasters. CERT instructors can change PowerPoint slides to better focus on their local training needs. The Instructor Guide is for instructors of CERT Program Manager courses, which teaches new CERT program managers how to effectively manage a CERT program. The Instructor Guide provides effective teaching practices in various aspects of CERT management, including managing volunteers and developing program plans. The individual sections of the Instructor are available in Microsoft Word format, so that instructors may change the material to best suit local training needs. The Participant Manual is for the use of students in CERT Program Manager Courses. The Manual provides effective practices in managing a CERT program, and topics include working with volunteers, developing a program plan, and sustaining programs. Each unit of the Participant Manual is available in Word format, so that users can change the material to better fit local training needs. These PowerPoint slides are intended for use in CERT Program Manager Courses, and follow the same class outline as the Program Manager Course Instructor Guide and Participant Manual. The topics covered include developing and promoting a CERT program, sustaining a CERT program, training and exercises, and working with volunteers. The slides are available in both PDF and PowerPoint formats. The PowerPoint slides can be changed to better fit local training needs. The Instructor Guide provides guidance on teaching CERT classes. This set of resources includes the Hazard Annex, which provides an overview of 13 natural and manmade disaster types. Each section of the Instructor Guide and Hazard Annex is also available in Microsoft Word format, so that users can change the course to best suit local training needs. All materials are in Spanish. The Participant Manual is meant for CERT students' use. The Manual covers all the Basic Training topics, and also includes a Hazard Annex. The Hazard Annex provides an overview of 13 natural and manmade disaster types. Each chapter of the Participant Manual and Hazard Annex is available in Word format, so that users can change the material to fit local training needs. All materials in this resource set are in Spanish. These PowerPoints contain material from both the Basic Training units and the Hazard Annex, which provides an overview of 13 natural and manmade disaster types. Each PowerPoint is available in Microsoft PowerPoint format, so users can change the slides to best fit local training needs. All materials in this resource set are in Spanish. The CERT supplemental module on Animal Response I is the first of two modules that make up the CERT Animal Response training. CERT supplemental training builds on the CERT Basic Training course and is intended for CERT members who have completed the basic training. Animal Response I will teach CERT members emergency preparedness for animal owners and how to recognize specific animal behaviors. The CERT supplemental module on Animal Response II is the second of two modules that make up the CERT Animal Response training. CERT supplemental training builds on the CERT Basic Training course and is intended for CERT members who have completed the basic training. Animal Response II will prepare CERT members for situations involving animals that they may encounter in performing their broader CERT response functions. In this four-hour module, CERT members will learn: 1) the role of CERT in communications during an activation; 2) how to use a communications plan; 3) the use of different communication modes and strategies; and, 4)how to use communication devices. The materials are in Word format and PowerPoint, and can be tailored to better fit local training needs. In this four-hour module, CERT members will learn: 1) how CERT Basic Training concepts relate to leadership; 2) the characteristics, skills and responsibilities of team leaders, and how leaders and team members interact; 3) different styles of leadership and how they apply to CERT situations; and, 4) examples of how CERT leaders run successful team operations. The materials are in Word format and PowerPoint, and can be tailored to fit local training needs. In this four-hour module, CERT members will learn: 1) how CERT Basic Training skills relate to crowd and traffic management; 2) effective communication strategies to direct traffic and crowds; 3) crowd management skills and how to put together a basic crowd management plan; and, 4) using traffic control devices to safely manage traffic in various situations and how to put together a basic traffic management plan. Materials are in Word format and PowerPoint, and can be tailored to fit local training needs. This four-hour module will train CERT members to: 1) relate CERT Basic Training skills to flood response; 2) identify a flood and the dangers of working around floodwaters; 3) work safely and efficiently with sandbags; and, 4) construct a sandbag barrier correctly. The materials are in Word format and PowerPoint, and can be tailored to fit local training needs. This four-hour module trains CERT members to safely set up and perform the non-medical functions of firefighter rehabilitation. CERT members will learn: 1) the definition of and need for firefighter rehab; 2) the physiological threats to firefighters; 3) an overview of what happens at the scene of a fire; and, 4) how CERT members set up and what they do in the rehab area. The materials are in Word format and PowerPoint, and can be tailored to fit local training needs. This module includes two four-hour units to train CERT teams to design and conduct exercises for each other. CERT members will learn: 1) FEMA exercise guidance and HSEEP concepts; 2) criteria for well-designed CERT exercises; 3) steps and documents used in designing and conducting an exercise; and, 4) challenges and smart practices for conducting a CERT exercise. Participants will begin the exercise swap design process as part of the course work.